Question: What’s the difference between a CAP pilot and a pig? Answer: There’s just some things a pig won’t do. Doug Liman’s American Made stars Tom Cruise as Barry Seal and Connor Trinneer as George W. Bush. Sarah Wright plays the character of Lucy Seal who, in the movie, represents Barry Seal’s second wife. The film has already been released in the United Kingdom and the critic reviews have been very positive for an exhausting ride of excitement, humor and true history lessons. Drama, artistic license and the legal compromises required of Hollywood movies aside, the true story of Barry Seal is a frustrating and exhilarating read all on its own. The best biographical text on Seal is Barry and the Boys by Daniel Hopsicker. The third chapter of that book is titled Learning to Fly – The Civil Air Patrol Way. There are also free summaries from that same source and others available online. On June 28th 2015, cameras were rolling at Peach State Airport in Williamson, Georgia. The building for Griffin Composite Squadron Civil Air Patrol was featured along with extras dressed-up as 1950s era CAP members and cadets in Air Force Summer Shade 193 Silver Tans uniform. As one AuxBeacon reader has observed in a comment below, the scene was shot to represent content from Learning to Fly the Civil Air Patrol Way a chapter in Daniel Hopsicker’s book Barry & The Boys. Civil Air Patrol leaders, noted for efforts at revisionist history, would not be pleased with making any contribution to a film that exposes US intelligence as indifferent to or inspired by Barry Seal’s drug running for the Medellín Cartel. The connections made to Civil Air Patrol’s David Ferrie and Lee Harvey Oswald would also not be appreciated. Barry Seal was born in Baton Rouge, Louisiana in 1939 and was raised by a member of the Ku Klux Klan. In 1952, teenager Barry Seal joined the Civil Air Patrol in Baton Rouge and soon participated in a joint training exercise with CAP’s New Orleans squadron where he met Lee Harvey Oswald and his flight instructor David Ferrie. Most Americans know that Oswald and Ferrie were both later implicated in the U.S. government recognized conspiracy to assassinate President John F. Kennedy. According to his third wife, Deborah “Debbie” Dubois Seal, “Barry Seal flew a getaway plane out of Dallas after JFK was killed.” Photographic evidence that came out in the early 1990s makes this claim entirely plausible. Seal’s recruitment into the CIA likely began after he joined the Civil Air Patrol, through contacts with Clay Shaw and David Ferrie, but the first evidence is found in 1962 when he was in his early twenties. Seal joined the Special Forces Reserve in late 1962 and about a month later was photographed in a Mexico City nightclub sitting with CIA operative Porter Goss and the rest of Operation Forty, the special operation charged with assassinating Fidel Castro. The above photo of the members of Operation 40 was discovered among keepsakes kept in the safe of Seal’s widow, Debbie Seal. It was apparently overlooked by a 7-man team from the US State Department which arrived at her house in 1995 to comb through her records. 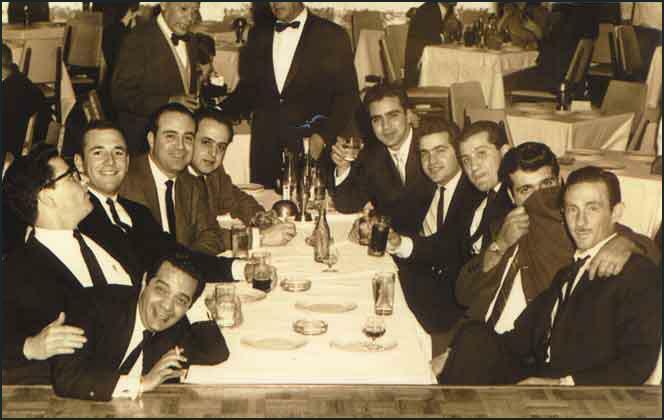 Stamped January 22nd 1963, it bears the name of a nightclub in Mexico City and reveals a mixed group of apparent Cuban exiles, Italian wise guys, and square-jawed military intelligence types. Daniel Hopsicker uses it for the cover of his book. On May 1st 1963, Seal was transferred to Company D of the 20th Special Forces Group, the company that was dispatched to Memphis on the same day as the assassination of Martin Luther King. When the Memphis Commercial Appeal conducted an investigation of the 20th, they found it composed of a highly unusual number of veterans of CIA assassination operations in Southeast Asia. The 20th was also said to have a domestic intelligence network run for them by the KKK. In 1967, Seal started working for Trans World Airlines as a pilot, but was fired from TWA in 1972 after he was caught in Mexico with explosives that were supposedly on their way to anti-Castro Cubans. Later in the 1970s, Seal had been coaxed into acting as a courier between Panama’s General Noriega and the CIA. According to Debbie Seal, her husband became involved in drug smuggling in 1975. On December 10th 1979, Barry Seal and Steve Planta were arrested in Honduras, after arriving from Ecuador with 40 kilos of cocaine. Newspapers reported that $25 million worth of cocaine was confiscated and the men were charged with having 17 kilos of cocaine in their possession. Seal spent nine months in prison before being released without charge. On and on the story goes all the way up to the Iran-Contra Affair and Seal’s murder on February 19th 1986 after Ronald Reagan exposed the photographs that Seal took of cartel members in a US television broadcast. On the matter of the character of Lucy Seal in the film, historical records show that Barry Seal had been married three times. He married Barbara Dodson in 1963, and the couple had two children before they divorced in 1971. Seal then married Lynn Ross in 1971, but they divorced a year later without having any children. Seal married Debbie Dubois in 1974. In the fall of 2015, Lisa Seal Frigon, who was born of Barry Seal’s first marriage and now administers the estate, claimed in a lawsuit that her father’s third wife and three children born of that marriage sold Seal’s life story rights to the movie studio for $350,000 without court approval or the estate’s consent. Three decades on, reports the DailyMail, Debbie Seal talks about her ongoing pain, reveals she forgives her husband’s killers and tells why she still seeks answers about the death. 10 Comments on "“American Made” CAPs Off This Friday"
Civil Air Patrol’s Tony Pineda is the son of Dr. Antonio Pineda who was an attorney in Cuba when Castro took over. The elder Tony Pineda fled Cuba with fellow countrymen who shared his desire to be trained to return and fight against Fidel Castro. In the United States, the senior Pineda learned about Guerilla Warfare and returned to Cuba for the failed Bay of Pigs Invasion where he was captured and imprisoned. Eventually, through a Bank in Canada, the United States paid a ransom of $62 million, all but $9 million of which was paid in drugs and other supplies. The senior Antonio Pineda was freed and came to Houston to be reunited with his wife. In 1965 he joined the faculty of Lamar State College in Beaumont, Texas. By 1969 he was assistant professor of modern languages at Lamar and working on a book about the Bay of Pigs Invasion. Stephen “Bumpfire” Paddock, the Vegas shooter was a licensed pilot. These types of nut cases seem to flock to the CAP. Did anyone look to see if he was ever in Civil Air Patrol? They tend to do a good job covering up things like that. I met the CIA representative at the CAP Civic Leadership Academy earlier this year. They want new recruits for their cyber program. How BORING! I agree with what Barry Seal said. He had an AWESOME life. Where do I sign up for that? Great ride of a movie, but I still can’t stop laughing over the “first in your class in Civil Air Patrol” line from the CIA handler! 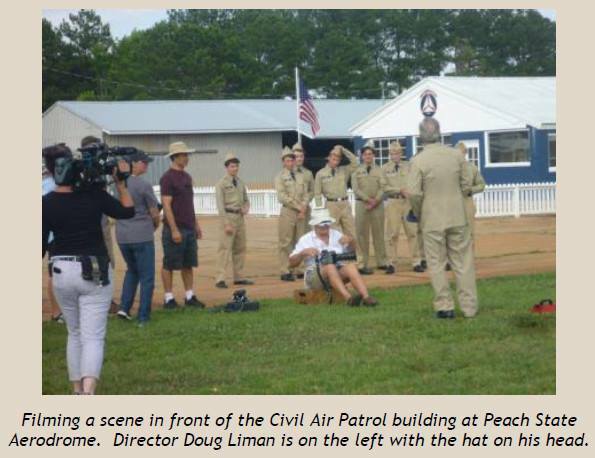 I am sending you some of our pictures that were taken during the June 2015 filming for this movie at Peach State Airport in Williamson, Georgia. Note our Griffin Composite Squadron Civil Air Patrol building and movie extras dressed as CAP members and cadets in the 1950s style brown uniform. The scene was shot to represent a chapter in Daniel Hopsicker’s book “Barry & The Boys” but was cut from the film. You may wonder why and investigate to report for your readers. I am also sending you the August 2015 Candler Field Museum Newsletter which has a photo of Richard Epton posing with his arm around Tom Cruise in front of the CAP squadron building. Epton gives rides to Griffin Composite and other CAP cadets in his Gull Wing Stinson. American Made was also filmed in Ball Ground, Cherokee County Georgia, to represent the small town of Mena, Arkansas. I will be sending you pictures from all over Georgia that may be useful to you. If you want to support more fun down in Mena with Civil Air Patrol’s 83rd Composite Squadron, be sure to see the movie at the Malco Cinema on Waldron Road in Fort Smith, Arkansas. My friend’s son is a c/Capt in Civil Air Patrol and he has been following the evidence you have been exposing. At first I told him not to believe any of this, but now it is very clear just how guilty we all are in the program for not heeding the cries for help. I always wanted my son to join Civil Air Patrol and be recruited by well-to-do back-door men to serve as an expendable patsy for a powerful Book and Snake like Porter Goss. Sadly that never happened, but my daughter is in CAP and her commander says she can really bring it. So, I guess I got that going for me. The Civil Air Patrol building on Peach State Airport in Williamson, Georgia was used as a background for the scene. Several shots were filmed using Ron Alexander’s Piper J-3 Cub being flown by a stunt pilot. They were recreating scenes of the young Seal learning to fly and first soloing an airplane. A number of period airplanes were parked nearby to provide a realistic background. At first I resented your effort here, but now they’ve come for me. Day after day and month by month you are figuratively burning down the Civil Air Patrol playhouse of these CAP sodomites (some figurative, some actual) who act above the law in pushing the fid into innocents who stumbled onto their web and racket. I am going to help you return the favor on what they are tying to do to us.